Do you do cilantro, or not? I had cilantro pop up in my garden very early this year. In fact I had to save some of it from being destroyed by the man who plows our garden, back in late February. We had some very warm spells in February and even though we didn’t end up planting much garden in March, by the end of April we had nice volunteer cilantro—but of course no home grown tomatoes yet, for that delicious pairing. 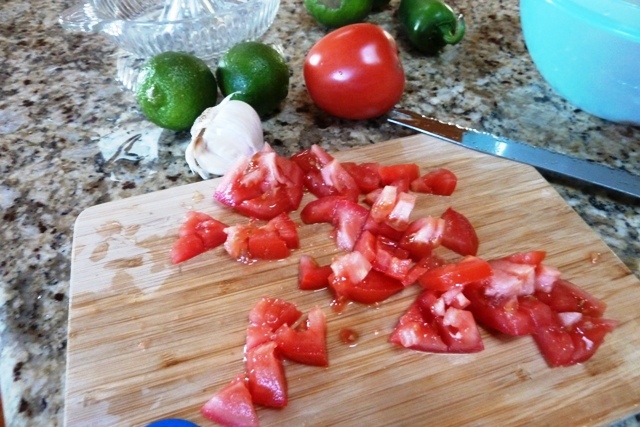 Nevertheless, I splurged on a small supply of Romas and stirred up a batch of pico de gallo for a staff potluck where we were supposed to bring dishes on the theme “Cinco de Mayo” in early May. Mexican, in other words. I found my friend and former colleague Wayne’s recipe for pico that he once made for a staff potluck. At that time, I had been so blown away by the flavors of his Chicken Fajitas that I begged his recipe, and tried it at home. Some of our children were still at home at the time and I’ll just say they were so not impressed. Nowadays I think all of my kids enjoy dishes flavored with cilantro, but for that first time with cilantro, at least at my table they were pretty much all thumbs down. I was pretty devastated. Where had I gone wrong? It was a few more years until I learned the truth that some of us may literally have a gene which allows us to like cilantro, and some of us don’t. A New York Times article gives a decent explanation of the why. So no judgment here if you are not all rave-y about a dish that, according to my husband, reminds him too much of the smell of stink bugs. Or soap, if that’s the way it hits you. Yes there’s that, and I get it, but if the pico is properly marinated and chopped, it is so complex with flavors and in my book, yummy. Mix a day ahead, or let marinate overnight. 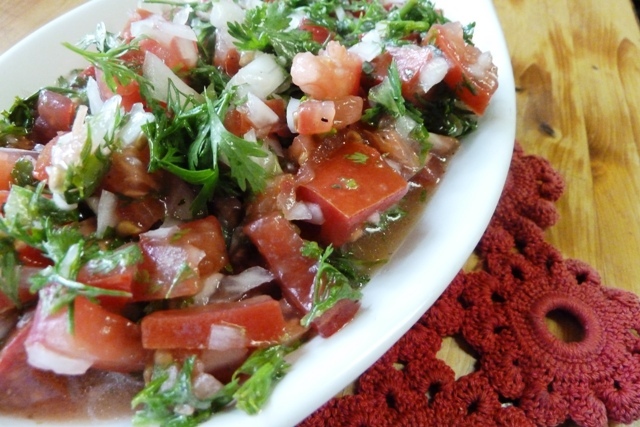 Use as a salsa dip on anything you like salsa with. Makes about 2 cups. So of course the question of the day is: do you like cilantro, or not. Let us know! I’d love to hear your story. Between 5-15 % of the population seems to be adverse to cilantro according to various sources, and according to your country of orgin. Google it. Some feel/claim you can become acclimated if you try. Wayne and his wife Carmen, who was one of the food editors for my book Whatever Happened to Dinner, have multiple wonderful recipes in it! Check it out if you never have. I just planted some last night in my herb garden…just because. 🙂 I’m not a big fan, but it’s nice to have it on hand in case a summer recipe calls for some. For me a little bit goes a long way. I think if one uses it in moderation it’s very complimentary to a dish. I think you are right that a little goes a long way. I had to learn that, I think. I love it in a burrito at Quiznos, for example. 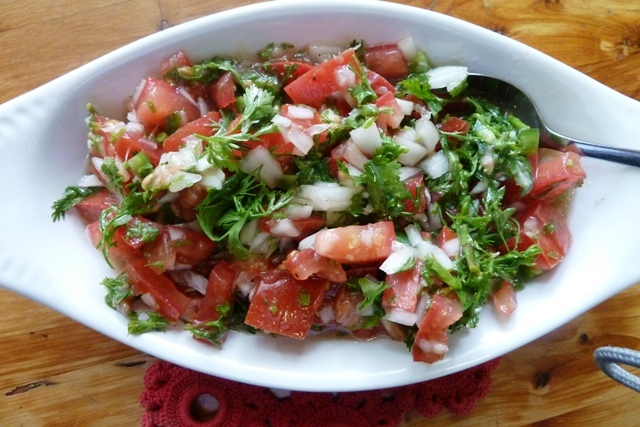 All these recipes renew my plan to plant cilantro but again I hope the hot weather in July does not totally destroy it. I’m glad if they inspire you. So they don’t like hot weather? I haven’t grown a lot of cilantro, I guess this is my 2nd or 3rd time. I guess they go to seed in hot weather. Right? 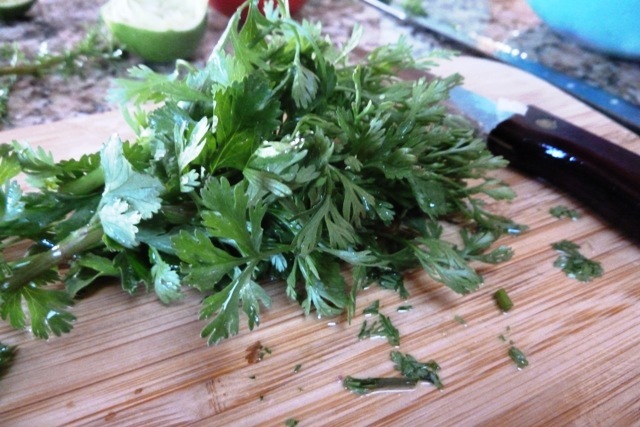 We like cilantro and I use it in Mexican, Indian and Thai dishes. In my Indian cook book they call it coriander and they use a lot of the ground seed also. We grow it ourselves for the fresh. I bring my plants in over the winter so we can continue to use it. I have not had a problem with heat, but we certainly don’t get as hot as India. A way we like to use it is in fresh rolls. You buy the rice paper discs, soften them a few seconds one at a time in hot water then fill with slivered fresh vegetables like lettuce, carrots, cucumbers, fake crab meat, thin cooked noodles, cooked chicken, tofu, shredded cabbage. What ever you like. The Hmongs here also add in a bit of fish sauce but we don’t– we like as is. Then add a couple sprigs of cilantro and roll up and serve with sweet chili sauce. Eat within one day as the rice paper shells dry out and get tough. This makes a nice summer meal…a handheld salad. I love your description of the rice fresh rolls. They sound delicious although I maybe would leave out the crab meat (fake or otherwise) for me. Do they also call those spring rolls? Thanks for the idea and great description. I think they are a version of spring rolls. Spring meaning that is season they were originally meant to be eaten. So spring rolls in other places could be fried. 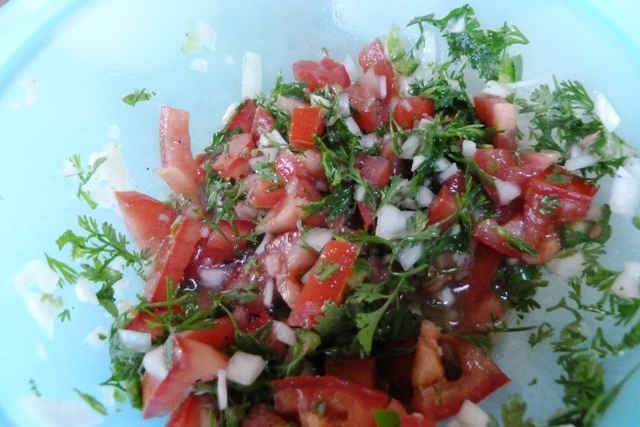 I do not like cilantro and so I make it more of an Italian Dish by adding fresh basil or fresh oregano. « Forty-One Years of Eat, Pray, Love.